First off, why did China and Japan get a version with microSD? A lot of users would love to bolster the device's storage with an additional 64GB. Second, why isn't the best Android phone of the year on Verizon? Will it ever come to Big Red, or should we quit holding our breath? As for the lack of love from Verizon, Gordon couldn't say as much. "It's always a great thing to have our phones on as many operators as possible, but we've got nothing to announce in terms of Verizon." In the past, Verizon has always carried Droid-branded devices from HTC. It carried the HTC Droid DNA, but not the HTC One X or the One X+. 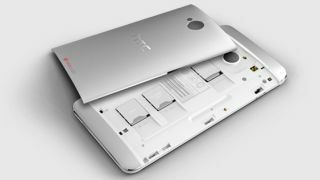 Perhaps it wanted its own special version of the One and HTC wasn't willing to comply? Still, rumors are flying about the HTC One coming to Verizon. Maybe it'll breakdown and carry that red version of the HTC One we glimpsed briefly online? It sure is pretty to think so.